Over 29 million Americans have Diabetes 2, and 40% of Americans are expected to develop Diabetes in their lifetimes. This is an epidemic that is cutting short the lives of too many Americans! Diet changes are the cornerstone to treating type 2 diabetes. Evidence suggests that a low-fat, plant-based diet may be the most effective way to manage the epidemic. But what changes, exactly, you ask? Here's an infographic from PCRM that helps explain things. Want to learn more? 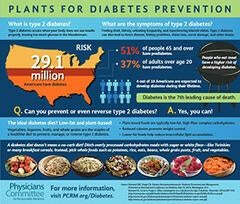 Check out this article at the PCRM website about the benefits of a vegan diet in preventing and treating Diabetes 2. Of course, here at Veestro we know a thing or two about a plant-based diet! Check out our wide selection of delicious 100% plant-based entrees, salads, soups, juices, and snacks and desserts!